While listening to songs and music in your phone, you might want to take a look at the lyrics of the song. May be you want to sing along with the artist or may be you just want to know what the song is actually saying. 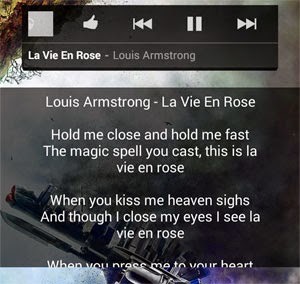 Instead of going to your browser and searching for the lyrics of your currently playing song, you can load it automatically in your Android phone. How to load lyrics for the currently playing song in my Android phone automatically? This has finally been made possible with a new app called Lyrics4Tube. Using this app, you can directly load or search YouTube music videos. You do not need to load the YouTube app separately. This app itself has the ability to load videos from YouTube. You can, however, share the currently playing videos in YouTube app to this Lyrics4Tube app. That way the song will be directly loaded without you having to search for it again. When the song loads, the lyrics for it are displayed right on the screen. No need to search it manually. The standard controls of a music player is also displayed at the bottom once you tap on the currently playing video. Besides being able to load lyrics for YouTube videos, this app is also able to load lyrics for songs that your device plays. Currently apps and music players such as Android Music Player, Google Music, Winamp and Last.FM player is supported. To load the lyrics for songs playing via any one of the above mentioned music players, just click the settings icon on this app and click on "Music player mode". A transparent area for lyrics will be shown above your normal apps. Load the music player of your choice and play your favorite song. Then this app begins its work and searches for the lyrics immediately. The lyrics are displayed on the transparent window almost instantly. This app is currently in beta and is being developed as we speak. New versions and additional features are expected soon. Watch out for it.